“…Every Outing is a Bravura Performance…” | Lord...What's My Motivation? At the end of the run, I will have performed Gaston 36 times. I’m breaking apart from a cast that has been my second family for nearly a year. We’re saying goodbye to a beautifully constructed turn-table set and over $15,000 of custom costumes, which will all be sold or rented out. We’ll be saying goodbye to characters that we’ve rehearsed, created and made our own. Rehearsal time lasted from Monday thru Friday from 7pm to 11pm in the upwards of 24 weeks during this time. I will no longer be able to sport Sonic the Hedgehog-like eyebrows. The tops of the boots are held together with Gaff tape...the shirt has holes in the armpits....and the wig has almost evolved into a living creature....but truth be told, I'll really miss playing GASTON when "Beauty and the Beast" closes. It’s sad. As a teacher, I’ve only been able to offer my students the chance to be in a play or musical that lasted one weekend. (A total of 3 shows a run!) We’ve shared the gymnasium and were only able to give up that space for one week in the past. Now we have this big, beautiful theater space at Faith Lutheran and for the first time we’ll be offering two-weekends of shows, eight total. I’m very excited. Before, it always felt like we JUST got our groove and then we’d have to strike the set. We are working on monologues in class, and I got after a few students who were dinking around in the corner when they should have been rehearsing, and one of them looked at me and said, “I’m done.” I asked them to perform it for me. They said the monologue wasn’t memorized yet. I said…”then you’re not done.” They replied that after reviewing it over and over, they were getting bored with it. This was what I was looking for….(Ha! You fell into my trap, you little stinker! )….and it sparked a nice dialogue about how to manage a sense of “FIRST-TIME-NESS” when performing and how to make something your are creating onstage fresh and exciting each time. Thirty-six shows in the same big ‘ol boots…carrying the same prop rifle…pining for the same princess….how can I NOT get bored with that, one might wonder. Well, first and foremost…I don’t! I’m blessed to be working with an ensemble and directors who keep me on my toes each night, hold me accountable and constantly challenge my limitations and expectation. That’s not going to happen all the time, however. You can’t count on a magical cast every time. You have to create the magic yourself. My mother-in-law and a family friend came into town from Michigan to see the show this weekend. I was very happy to see them and very grateful to have them in the audience. (The frosting on any cake for a performer is having a loved one in the audience.) They even treated my wife and I to tickets to “JERSEY BOYS” which was fantastic. I highly recommend you see this show. I haven’t been THIS impressed with a show since “WICKED.” Tony award winner? Well, I can see why. It’s brilliant on so many levels. 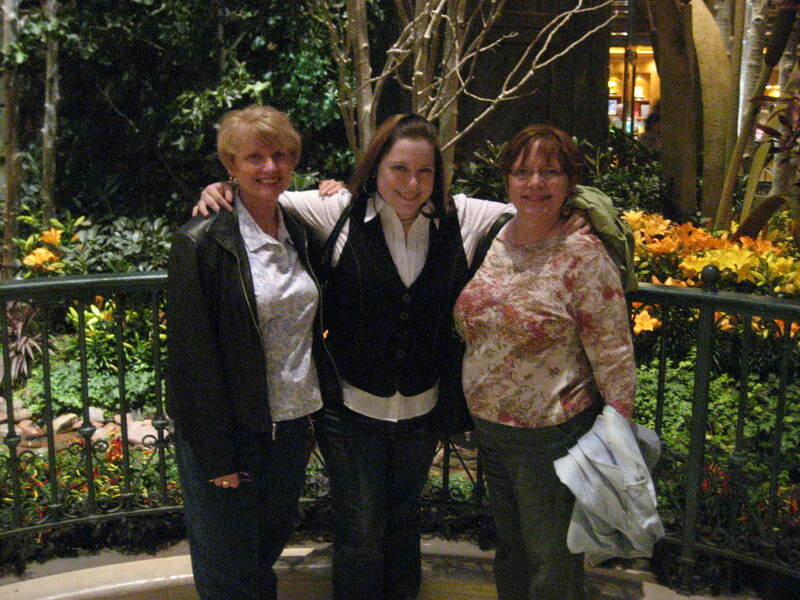 Lynn, Emily and Mama Sue stand in the Bellagio gardens before "JERSEY BOYS." They had a talking tree there. I was happy. I had grades to enter and my weekend time was nearly gone. I am broke right now. Lately we’ve been struggling to keep funds available for anything extra-curricular. The simplest transactions (like buying a Starbucks or buying a pair of socks at Ross) is suddenly a major surgery…and I’m cutting into our life savings. I’m sad for the show to end. I’m feeling burdened by many, little technical responsibilities that were dropped in my lap at school. I’m frustrated because everyone is telling me to chill out, because I’m stressed. I didn’t know what to do. I didn’t want to depress my mother-in-law on her visit. I didn’t wan’t to seem mopey. But, I didn’t want to air my frustrations either. I was trapped! My wife was looking at jewelry today at a store during our excursion. She was admiring a beautiful emerald ring. (Her favorite stone.) She would have loved to have bought it. I would have loved to be in a position TO buy it. We moved on…it wasn’t a big deal. You see, I’m not a fan of jewelry. I wear my wedding ring…that’s about it. Sometimes I’ll wear a watch, until it gets annoying, then I take it off and promptly lose it. But, jewelry has NEVER been a big deal to me, and I struggle with understanding people who have a massive amount of jewelry. Everybody from your textbook trophy wife with thousands of dollars of diamonds and not enough social events in which to brandish them all….to that cocky, super-tan dude with 10 Rolexes at home and one of those pine-scented boxes to keep them all in. I don’t get it. Why is something SO expensive…and yet, so insignificant…so important? Is it a status symbol? Is it symbolic of something? Is it like one of those Green Lantern rings that shoots out beams!? I cannot justify purchasing jewelry. “But, Erik….my fifty pound diamond tiara means something to me.” Okay…it means something to you. It’s still insignificant. Disagree with me if you like, but anything that isn’t something you need to have in order to live (meaning heart-beating…breathing in and out) is a LUXURY. I’m not saying luxuries are bad. I have many luxuries. I’m just saying….jewelry is DEFINITELY a luxury. 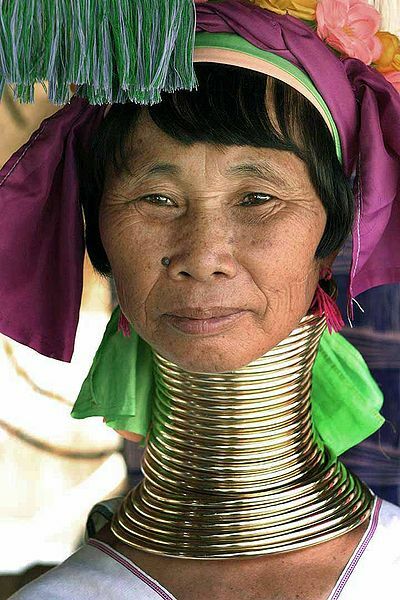 "Honey, does this necklace make my face look fat?" Don’t get me wrong…I have bought jewelry for my wife…and I will continue to attempt to fulfill any “shiney” desire she has…but for me, no thanks? I have the same theory about my truck. I like it. It’s cool. Gets me where I’m going….but it’s a truck. Who cares. If someone said to me…”get rid of it…here’s a different one.” I wouldn’t care. I continue to have a hard time justifying making time to wash the thing when it’s just going to get dirty again. Oil change…okay. Flat tire…fix it. But…it’s a resource to get me to and from places, that’s all. Doubling back, I suppose you can add “not able to get my wife shiny things when she would like to have them” to my list of things that might have made me blue today. I finally told my wife that I think I pin-pointed my all-encompassing “blue-ness.” I felt a sudden wave of “Am I being used to my potential?” (You know…the potential that God has planned for me.) I’ve been given certain gifts. I also LIKE to do certain things. Squash those two together…and I should be able to lead a happy, fulfilling life, right? I feel sometimes like shows come to an end so quickly….funds dissolve way too fast….and “wants” overcome what you’re actually able to provide. One piece of advice that I offer my students regarding their monologue is to take a look at the scene through the eyes of the other characters….the director….the lighting designer….the audience members (older ones, younger ones, etc.) and then re approach. 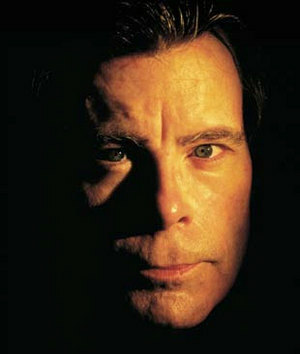 Find new and exciting twists and games to play AS that character with the scene before breaking the scene down again….tossing away all of the “yuck” and keep all of the “awesome.” That’s how Stephen King writes, you know. Ever wonder how he publishes all of those books? Ghost writers? Sure, sometimes…but for the MOST part, he pulls up a chair and begins with a general idea, and BANG! He writes and writes and writes and writes…..without even stopping to THINK about what he’s writing. He’ll pump out 200 pages in one afternoon and then go BACK and take a look at what works, what doesn’t. He takes a look at the “moments” in the rough draft from other perspectives and then goes back to rewrite. The dude just freaks me out a little. I took a couple of steps back. 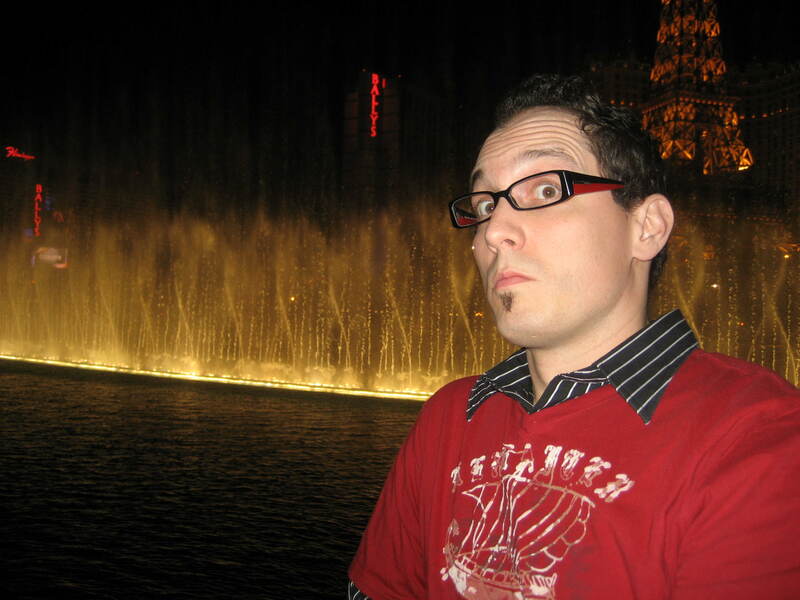 (We were at the Belligio fountains at the time.) I thought about today from my mother-in-law’s perspective. My our friend Lynn’s perspective…from my wife’s. We had a great night tonight. I look at tomorrow (Monday) and I think….errrr. But, you know, from the student who is delivering their monologue in my class, they have a completely different outlook. From the audience member who is seeing “Beauty and the Beast” for the FIRST time tomorrow night…there’s a completely different outlook. I never tire of the Bellagio fountains. You know…keepin’ it “fresh”….keepin’ it in the “first-time”….it’s not easy to do. It requires me to step outside of my own self-absorbed little world to garnish a new perspective. But my approach…no matter what the reason or rhyme….should be wrapped tightly in the fact that I love performing. I love theater. I get to do what I love every day. Next time I get sad about not playing Gaston anymore, I’ll reflect on the fact that Gaston and I are not terrible unalike in the sense that we have a hard time looking at things through other people’s eyes. Maybe that will help me move on past closing night. Gaston will carry-on within me. “It’s about time (I) paid attention to more important things.” (Gaston says this in the show.) Perhaps those more important things are what lives and breathes inside each of the people I am in contact with every day. From that point of view…how dare I rain on their parade. 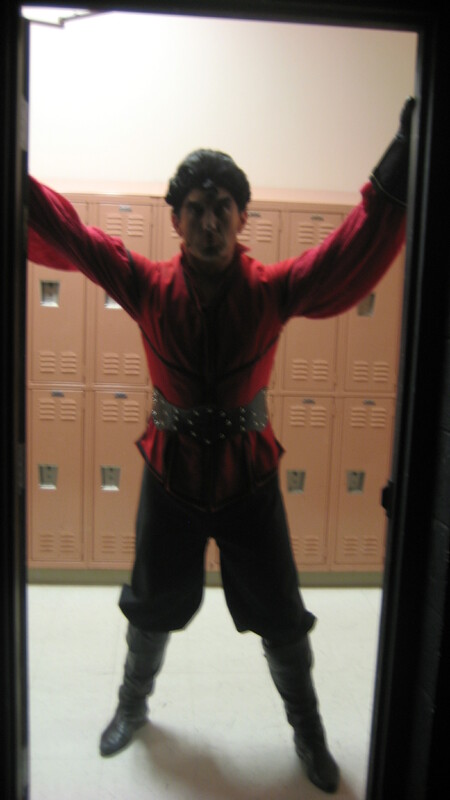 This entry was posted on November 17, 2008 at 2:43 am and is filed under ACTING ONSTAGE, DIRECTING FOR THE STAGE, THE HIGH SCHOOL THEATRE CLASSROOM with tags acting, Beauty and the Beast, Bellagio, Bellagio Fountains, Closing Night, Emerald, First Time-ness, Fresh, Gaston, Gymnasium, Jersey Boys, Jewelry, Monologues, Mother-In-Law, My Wife, Performing, Perspective, Sonic the Hedgehog, Stephen King, Students, Teacher, Theater, theatre, Wicked. You can follow any responses to this entry through the RSS 2.0 feed. You can leave a response, or trackback from your own site. Thanks for the great quote from SK – it makes me want to try harder. I’ve kinda given up lately and instead I should make more opportunities – make every day an opportunity to do what I love. 🙂 I’m glad you’re my friend! I always enjoy your blogging. As far as the show closing, I feel the exact same way. I will greatly miss everyone and the beautiful show that we have all created. Moments in the show, like Gaston, make me so proud to be able to do what we do. Just playing and having fun on stage, like we did around the bar in the song on Monday night, makes live theater so exciting. You are an amazing teacher and performer. It is such an honor to know you! The “first-time” illusion is one of the most important skills to learn as a young performer. Ironically, the illusion is most successful when you know the material backwards and forwards!